Super Rugby’s quarter-finals tracker has got the Sharks hosting the Bulls for a place in the final four while the Lions would travel to Melbourne for a shootout with the Rebels. 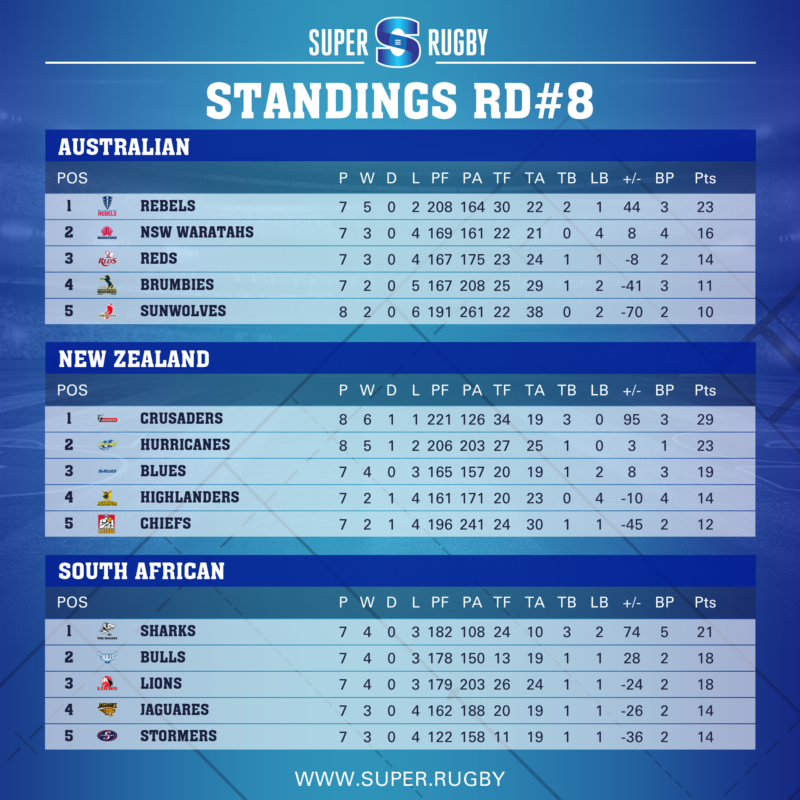 Based on the current standings after eight rounds of action, the Stormers are the only South African team not in the playoff frame, while the Crusaders, Hurricanes and Blues would fly the New Zealand Ensign, and the Rebels and Waratahs would advance from the Australian conference. In the Stormers’ defence, they’re set to wrap up a four-match tour of Australasia on Friday when they square up against the Rebels, while none of their conference rivals have explored the Antipodes this season. The Cape side will be desperate to extend a run of five wins from six previous engagements against the Rebels, but the hosts are currently Australia’s top team with a 5-2 record blemished only by losses against the Sharks and Lions, which makes a top priority of beating their next SA opponent. It’s tour time for the Lions on Saturday morning when they prowl into Canberra to battle the Brumbies, with Rasta Rasivhenge on the whistle. 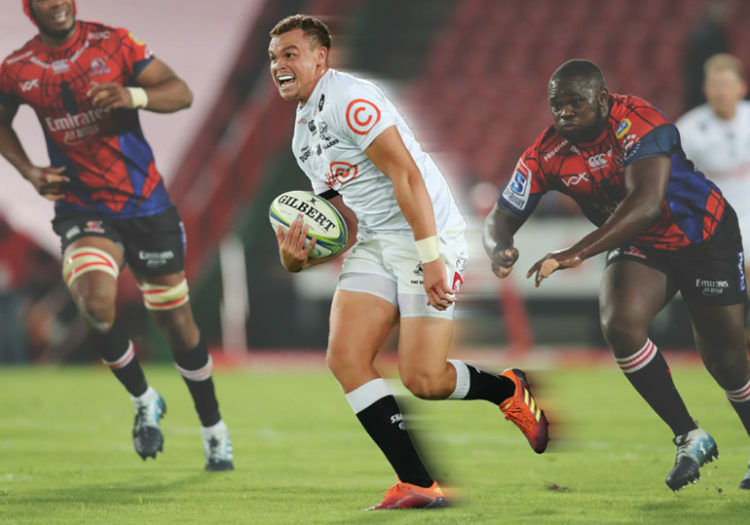 Swys de Bruin’s team bookended a narrow home victory against the Rebels with high-scoring wins against the Jaguares and Sunwolves, but that momentum hit a brick wall in Round 8 when the Lions were steamrolled by the Sharks in a 42-5 reverse at Ellis Park. While the Brumbies beat the Waratahs in their most recent match at home, that marks one win from their last five outings, including successive 36-14 losses against the Reds and Crusaders. The two-time Super Rugby champions have not beaten the Lions in Canberra since 2010. The Jaguares have never won in Durban, but the same was true of their record in Pretoria before they ambushed the Bulls 22-20 last week to complete a clean sweep of the Highveld heavies. Argentina’s Super hope, the Jags’ remaining victory this season came against the Blues; scalping the Sharks on Saturday afternoon would bring to four the number of wins against teams in the current playoff frame. It’s been a rollercoaster campaign for the 4-3 Sharks who have banked three crucial bonus points to coast into Round 9 as the SA conference leaders. Though they were stopped by the Bulls at home and away, the Durbanites hammered the Blues, beat the Rebels convincingly and smashed the Lions. That success against the Sharks was no fluke for the Bulls who also pumped the Stormers and Lions. But such dominance has thus far forsaken Pote Human’s team whenever they’ve faced opponents from foreign shores, leaking seven tries against the touring Chiefs in between twice surrendering to the Jags. It’s been 12 years since the Bulls obliterated the Reds 92-3 in Pretora and, on Saturday night, they’ll be hoping for some kind of a throwback in form against the Brisbanites who haven’t won at Loftus Versfeld since 2001. Barry, Sharkettes + 74 he he he and after being devoured by the Jags ?. Cheers. Quite the opposite actually Hermie. The points dif give a very quick perspective on which team has the best balance between attack and defense. The movement we have seen this week relates to a huge improvement in defense for the Stormers and some very ordinary defense from the Sharks! Lions propping up the table and you still have things to say. Gosh, how are those rose painted glasses? What a difference a day makes, 24 little hours…..
Jaguars will top the SA conference with the Stormers in the top 8, watch this space. I wouldn’t pay too much attention to Rob Houwing’s article on this subject, they are usually smattered with a healthy dose of bull dust! Nah, I don’t want to jinx them but I think the Stormers have a good chance of topping the conference. From here on in they have mostly home games, the Snaaks, Ballas and Kittens still have to do the Arstralian Hotstep. Etsebeth and Co are returning and the backline is starting to find a bit of form, even Die Ellendig managed to score try’s, it was quite comical to watch his face after he broke the line and scored, he had this look of absolute astonishment that he had actually for once managed to NOT die with the ball, hopefully this inspires him to do it again and again and again.